Saraswati is the Goddess of Learning and Knowledge. As a child, I was taught to seek Her help with my studies with this special prayer . The prayer is particularly favored by parents across Nepal and Mithila. The prayer is in three parts. First, visualize the Goddess. Second, call out to Her. Third, seek Her blessings. I visualize Saraswati in a particular form. 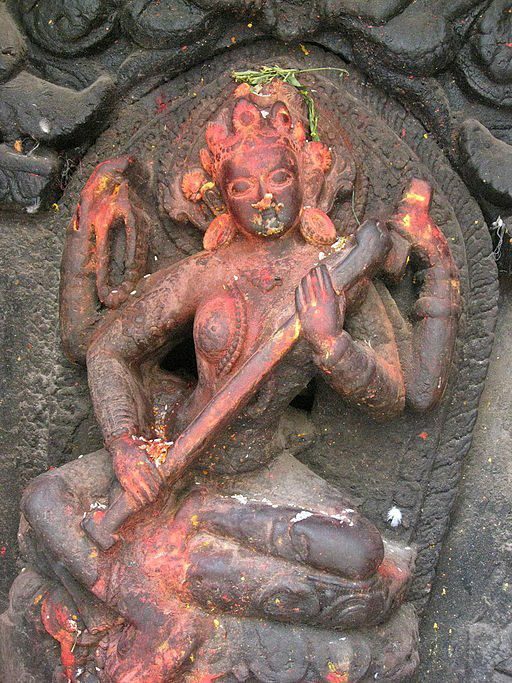 In this form, She holds the veena on one right hand and a book on her left. She is accompanied by Her favorite pet, the swan. Calm in disposition and beatific in expression, She is ready to grant knowledge to those who persevere. Focused on this form of Saraswati in my mind, I call out to her twelve times with twelve separate names. Each name evokes a specific attribute. Bharati = Speech. Saraswati = Power of the spoken word. Sharada = One who is holding the veena. Hamsavahini = One who is sitting astride a swan. Jaganmata = Mother of the Universe. Vagishwari = Goddess of the power of speech. Kaumari = Young girl. Varadayani = One who grants boons. Buddhidatri = Grantor of Knowledge. Brahmacharini = Pure. Chandraghanta = One who is adorned with a half-moon shaped in the form of a bell. Bhuvaneshvari = Goddess of all existence. This Saraswati, who is the power that animates, I ask that she bless me by residing at the tip of my tongue.